The aim of the publication is to assess the functioning of common agricultural policy (CAP) in the context of its relationship with the paradigm of industrial and sustained development of the food economy. 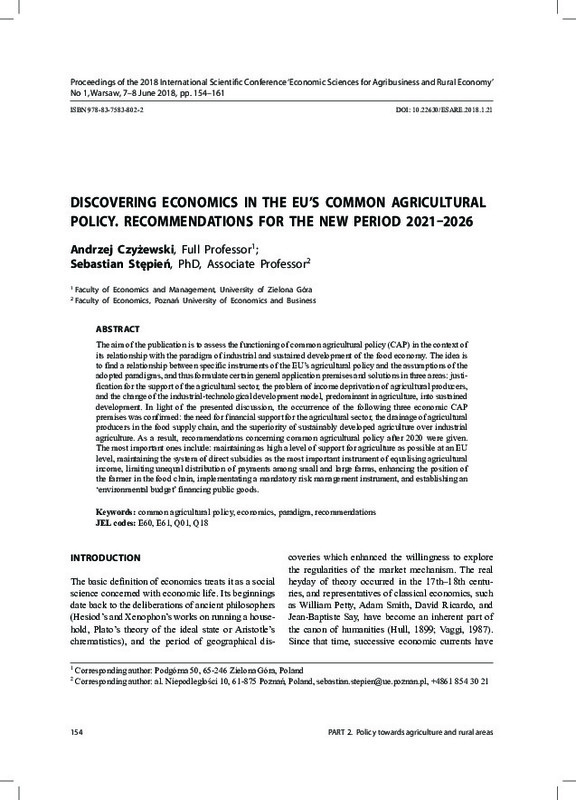 The idea is to find a relationship between specific instruments of the EU’s agricultural policy and the assumptions of the adopted paradigms, and thus formulate certain general application premises and solutions in three areas: justification for the support of the agricultural sector, the problem of income deprivation of agricultural producers, and the change of the industrial-technological development model, predominant in agriculture, into sustained development. In light of the presented discussion, the occurrence of the following three economic CAP premises was confirmed: the need for financial support for the agricultural sector, the drainage of agricultural producers in the food supply chain, and the superiority of sustainably developed agriculture over industrial agriculture. As a result, recommendations concerning common agricultural policy after 2020 were given. The most important ones include: maintaining as high a level of support for agriculture as possible at an EU level, maintaining the system of direct subsidies as the most important instrument of equalising agricultural income, limiting unequal distribution of payments among small and large farms, enhancing the position of the farmer in the food chain, implementating a mandatory risk management instrument, and establishing an ‘environmental budget’ financing public goods.